Understanding the various complications that can occur during endovascular treatment of intracranial aneurysms is important so that measures can be taken to prevent these complications from occurring. Having a standard plan or checklist for managing complications that occur during or following neuroendovascular procedures is important to decrease the risk of neurological deficits resulting from these complications. 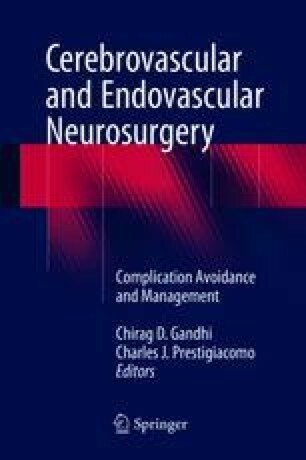 In this chapter, we review the causes, preventative strategies, and management strategies of complications which occur during endovascular treatment of intracranial aneurysms.